Research in materials, devices, and circuits has significantly altered the way we lead our lives. These technologies have made computers and modern electronics, including smartphones and HDTVs, widely available and affordable. Although the impact has already been impressive, the story is far from over: research in materials, devices, and circuits has found new impetus from micro-electro-mechanical systems (MEMS) and nanotechnology initiatives. 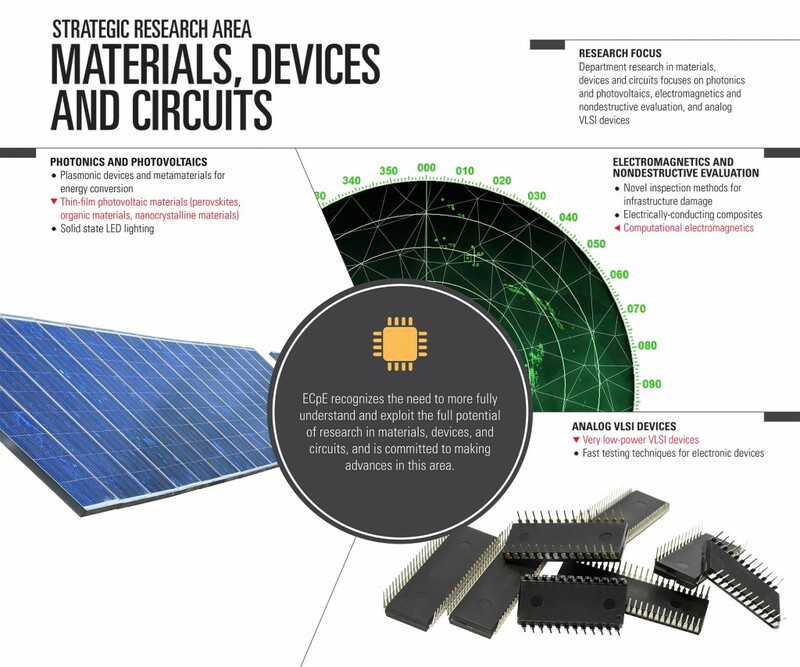 The Department of Electrical and Computer Engineering (ECpE) recognizes the need to more fully understand and exploit the full potential of research in materials, devices, and circuits, and is committed to making advances in this area. Research in this area has applications in consumer electronics, military defense, communications, and medicine. Professor Degang Chen developed an algorithm that dramatically reduces testing time and production costs for high-performance semiconductors. His methods have since been adopted by Texas Instruments. Assistant Professor Ayman Fayed received the 2010 Grow Iowa Values Fund Grant for $158,000 to develop low-noise switching power regulators for sensitive, portable communication and navigation devices. The new regulators wold replace inefficient components and could double the battery life of devices. The project is co-funded by Rockwell Collins. Assistant Professor Ayman Fayed received an NSF grant for $360,000 to develop new highly-efficient power delivery schemes for mixed-signal Systems-on-Chip (SoCs). Research is in collaboration with Texas Instruments. Researchers recently patented FastPlace software, a VLSI placer that is an order of magnitude faster than the previous state-of-the-art and reduced placing time from two hours to ten minutes. Two professors recently developed a method to test a 16-bit analog-to-digital circuit with a test signal of 7-bit linearity or less, meaning engineers now can use a device that is up to 100 times poorer in linearity metrics and still get accurate results while saving money on testing costs.